Archaeologists have discovered a massive 54,000 ton pile of basalt under the Sea of Galilee off the Israeli coast. The cone-shaped structure may have been an ancient burial ground. 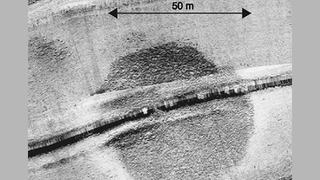 According to researcher Yitzhak Paz, the structure was originally discovered in 2003 by sonar, but divers have now been sent down to investigate. The object, which is twice the size of Stonehenge and built around the same time, could be as much as 4,000 years old. It measures 10 meters (32 feet) in height and about 70 meters (230 feet) across. The archaeologists believe it may have been a cairn — a massive pile of rocks used to mark burials. "Close inspection by scuba diving revealed that the structure is made of basalt boulders up to a metre long with no apparent construction pattern," researchers said. "The boulders have natural faces with no signs of cutting or chiselling. Similarly, we did not find any sign of arrangement or walls that delineate this structure." Interestingly, the site sits close to the now-defunct ancient outlet of the Jordan River — an area that had economic importance in the area during the Bronze Age. The researchers speculate that the structure was built on dry land, but has since been covered by the sea. Alternately, it could have been constructed under water as a way to attract fish. Check out the study (pdf) at the International Journal of Nautical Archaeology.